We are pleased to announce that a digital archive presenting materials by and about R. H. Boll is now available. A prolific writer, he served on the editorial staffs of three periodicals. He contributed hundreds of articles to their pages. He authored dozens more tracts and books. A persistent teacher, he conducted classes in several states. Nowhere, though, did he teach and preach more than at Portland Avenue Church of Christ in Louisville, Kentucky. His half-century of service to a single congregation is among the longest ministerial tenures in the Stone-Campbell Movement. There he preached weekly, sometimes taught daily, counseled daily, conducted tent revivals, launched a primary and secondary school, hosted Bible conferences and radio programs, visited the sick, buried the dead and trained another generation of ministers. Boll was convinced that the neglect of eschatology among Churches of Christ in his day contributed to a lack of devotion and an apathy towards missions. “In his teaching,” writes Hans Rollmann “Boll emphasized a premillennialism similar to that of Cyrus I. Scofield and William E. Blackstone, joining to it at the center of his thought a pronounced doctrine of grace and the personal indwelling of the Holy Spirit. Boll’s interest in eschatology was guided by his effort to restore to the church this vital dimension of early Christian life and thought and maintaining it as motivation for Christian spirituality and foreign missions.”** His views were met with enthusiasm in some quarters; in others he met vehement opposition. Boll stayed his course, however, and continued to publish, to teach and to preach. How did a Roman Catholic boy from Germany arrive at Nashville Bible School? How did that boy come to the faith that guided the remainder of his life? What was the shape and content of his preaching and teaching ministry…a ministry the effects of which continue to the present? What did Boll believe and teach that was so controversial? Why was it controversial? 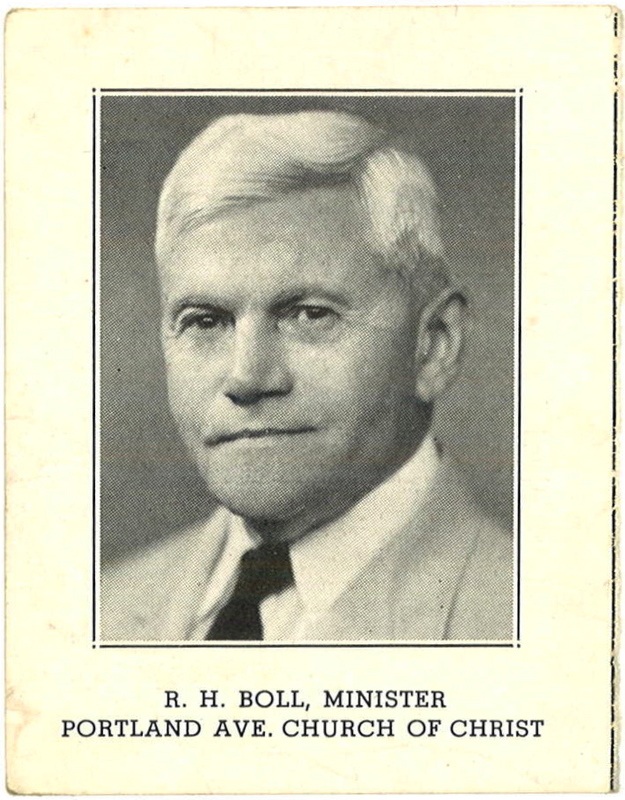 What is R. H. Boll’s lasting legacy to Churches of Christ? These are significant questions about a man whose chief desire was to be a simple Christian. His quest, and the controversy surrounding him, impacted the identity of Churches of Christ in the twentieth century. Now, nearly sixty years after his death, in order to answer these questions…or at least wrestle with them…we need resources at hand. Imagine arriving in Abilene, Texas to conduct your research at the Center for Restoration Studies in Brown Library at Abilene Christian University. You settle in at the reading room and the archivist brings a wide array of books, journal articles, tracts, letters and sermons, plus photographs, biographical and congregational files. Having those items at hand will be just what you need, right? But what if you cannot come to Abilene, Texas? What if, instead, ACU brings its archives to you? This digital collection assembles into a single virtual space a wide range of materials held by ACU’s Center for Restoration Studies. We’ve drawn from vertical files, manuscript and our audio collections. And this is only the beginning…we have more paper and digital content in preparation. We trust reading this blog is like sitting in our reading room with a wide array of materials spread before you. In a very real way, it is like being in Boll’s classes again, or looking over his shoulder at his notes while he preaches or teaches. A bibliography identifies relevant primary and secondary published sources. Whether you would like to browse photographs or embark upon an in-depth research mission, we hope these materials prove useful. *Lindy Adams and Scott LaMascus, Eds. Decades of Destiny: A History of Churches of Christ from 1900-2000. ACU Press: Abilene, 2004, pp. 133-134. **Hans Rollmann, “Boll, Robert Henry (1875-1956),” Encyclopedia of the Stone-Campbell Movement. Eerdmans: Grand Rapids, 2004, pages 96-97.